Brava Roof Tile designs, develops and manufactures Synthetic Architectural Roofing Products in natural profiles including: Spanish Tile, Cedar Shake, and Slate roofing. Brava’s roofing products utilize proprietary compression molding technology to create the authentic beauty of its natural counter-parts, in a lightweight, durable, and environmentally friendly material. 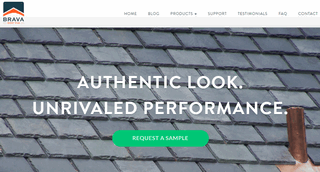 Brava’s roof tiles consist of 100% recycled post-industrial plastic material and have received 3rd party testing certifications for Class 4 Impact, Class A fire and up to 150 mph wind.